Dong people are well-known for cultivating dozens of varieties of glutinous rice, which are called “Kam rice” or “good rice”. They also typically grow maize, millet and mushrooms, and a variety of fruit, such as plums, peaches, pears, and watermelons, to supplement their diet. Dong people raise pigs, chickens, ducks, geese and fish for food, water buffalo for ploughing and for food, and dogs for protection and companionship. The “four pillars” of Dong cuisine are glutinous rice, pickled vegetables, red chillies and rice wine. Other popular local food includes barbecued fish, oil tea, and glutinous rice snacks. The Dong people also occasionally eat giant salamander, which is considered a rare local specialty. They will normally have two hot meals (breakfast and dinner) and one cold meal (lunch) every day. Cotton is locally grown and weaved into cloth that is used to make clothes. Silks and finer cloths are exclusively used to make festival clothing. Dong men will normally wear short jackets with buttons down the middle, although in the south they wear collarless shirts and turbans. 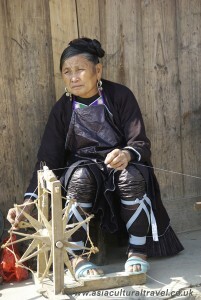 Dong women wear skirts or trousers that have beautifully embroidered hems. They wear their hair in a coil and wrap their legs and heads in decorative scarves. 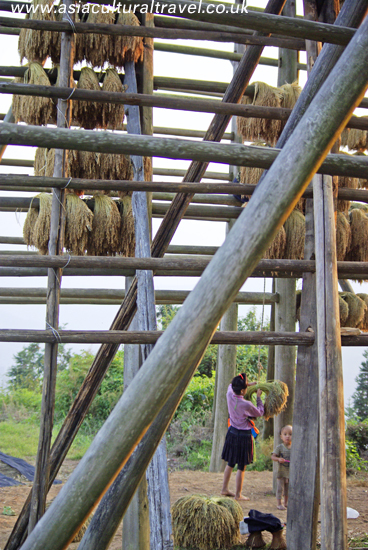 Most regions where Dong villages are found are also famous for their fir trees. Dong people use the wood from these trees to build their houses and other structures in the village. They are skilful carpenters, and are also accomplished at silverwork and wickerwork. Wickerwork is usually done by the men, who use materials such as glutinous rice straw and bamboo to make baskets and other wicker furnishings.